E-Learning, CBT, WBT Oh My! Our services accelerate collaboration, drive efficiencies, and consistently provide rapid, breakthrough results. Our proven and innovative approaches solve challenging problems, enabling us to serve as trusted advisors, and build long-term relationships with Federal and commercial clients. Our portfolio speaks for itself. Start working with the Falcon team today to discover what it means to make your software soar. A small sample of previous success. Let your next project "Set Soar"
Our cleared professionals are skilled at widget and application development in the Ozone Widget Framework (OWF). The possibilities are endless. This is just the beginning. Want to know exactly where that Picture was taken - quickly? 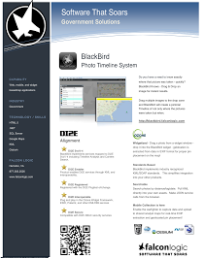 BlackBird Knows - Drag and Drop an image for instant results. 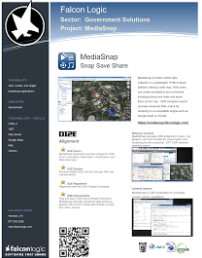 Drag multiple images to the drop zone and BlackBird will create a pictorial Timeline of not only where the pictures were taken but when. Widgetized - Drag a photo from a widget window - drop it into the BlackBird widget - gelolcation is extracted from data in EXIF format for proper pin placement on the map! Our award-winning graphic design team has created animation, logo, campaign material, technical design aides, 3D models, and more. Find out why our clients always return to us once they have discovered the unmatched Falcon approach to quality. Our E-Learning courses can be integrated into your Learning Management System (LMS) or SCORM compliant framework. Below is just a sample of the numerous courses our talented staff has developed for the Navy, Marines, FBI, DOJ, and more. We specialize in Android, Blackberry and iPhone implementations. If you're in search of creating a product that will actually sell to the mobile marketplace we can show you the top 3 key elements most firms neglect. The ultimate vocabulary expanding tool featuring over 1,300 commonly SAT tested vocabulary words. PrepMatters needed a design based on spaced-repetition and implicit learning research. The clean, streamlined interface has lead to improved sales and expansion into iPad and Android app Stores. The PrepMatters initial release was completed in less than 30 days. Ready to make profit. Users quickly adopted the product and it became an overnight success. 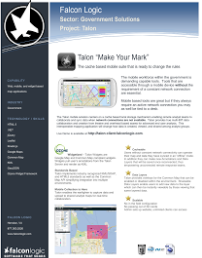 Falcon Logic was contracted by Field Data Technology to architect, develop, and maintain the mobile data collection and reporting application for the U.S. Army Program Executive Office Combat Support and Combat Service Support (PEO CS&CSS). The application collects corrosion inspection data of Army assets such as tanks and trucks including a detailed inspection of each sub-component. Data is collected on a Windows Mobile platform and synchronized with an ASP.NET website to provide asset tracking and reporting to management. Falcon Logic transitioned the initial solution from an MS Access based system to an ASP.NET and SQL Server implementation using C#. An advanced querying mechanism powering over 10 Crystal reports and online charts was developed for management reporting and asset tracking. The Eagles recently started a new social campaign targeted at their female fan base. The Falcon team was brought on to create a visually compelling site offering that would quickly build the fan base they were targeting. Additional NFL teams are interested in this new marketing niche and the Falcon approach to site design is well received. Considering having your buddy do it? Would you risk taking on a $14k proposal to get nothing? Of course not! Get your project completed for a real price with a guarantee of delivery. Eliminating the risk is not only smart its critical to your business. Don't make the mistake of thinking that cheap software development is getting you somewhere. Would you work on your own brakes and put your children in that car? Inferior software logic will cost you thousands! Having to explain every minute detail to an average developer will make Your blood boil! Our clients don't have to submit rigorous technical documents on top of hours of technical design meetings. Our software engineers more than likely have built similar systems to yours and can actually make suggestions to improve your idea. We don't expect you to do all the work. Thats what you pay us to do. We Build AND Design. 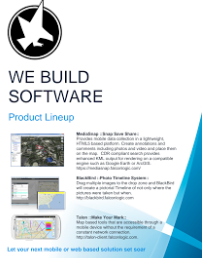 Our award winning staff of Software Engineers, Graphic Artists, and Mobile Engineers use the Falcon FULCRUM approach to deliver software solutions with a smile. We make the process fun and enjoyable and encourage creativity. We do not just sit back and wait for you to spell out every function and spec of your product. We add our suggestions and put our creativity to work to build you a more successful product. We do not take all of the business that comes in the door. Why? Because we guarantee results for projects we know we can deliver. We also ensure we schedule things correctly so our delivery times are met. We do not take on more projects than we can handle and thus delay everyone's delivery dates. This is an uncommon approach and what sets us apart.